Welcome to Spotted Eagle'sFlight Aviary! Our Online Store, Come On In! There is a lot of information here, so please be patient with the page as it loads, and be sure to check the entire page out! We are distributors for Flight Suits, and we are Beak Appetit' Affilates, so be sure to check those links out! We also make custom stands, swings, and toys for everything from Finches to Macaws and Cockatoos! We now have page awards available for your web page so be sure to check out the available awards page for details! Please use the handy dandy easy peasy links page (the link is below) to navigate this site. There are a lot of pages, and the links page is the easiest way to naviage! There are a couple of other new pages here as well, we have posted a wanted page and a page about our Rescues page as well. We are posting all of the rescue birds/animals stories on pages that are linked to our rescue page, so be sure to check them out! Also be sure to visit Jasmin's page. 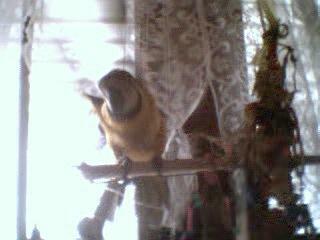 Jasmin was a Sun Conure who was raised by Parrotletes, and sadly, she lost her fight for life on July 8, 2003 at 5 months of age. Zorro The Miracle Conure has a special page and it is a story well worth reading! He is truely an inspiration to everyone who has heard his story, as was Jasmin. The Nursery page will feature our latest babies that are either hatched here, or aquired by us, and we will be updating that constantly too so be sure to check back there! We are also adding an avian humour page, so be sure to give us your submissions! Having said all of that, come in and make yourself at home! Just be sure to watch out for the Fids (feathered kids) because there is usually one underfoot somewhere! People have been asking if we still have Bourke's Parakeets, no we do not. We are looking for breeding pairs but do not have any available for sale. See the link below for more information on the ICA, it's a great group for everyone from the beginner to the old pro. two sisters, Julie Spotted Eagle Horse Cooper and Trina Brockett. I (Jules) do the grunt work and Trina does the books. I think I have the better job! and loves them no matter what. Doesn't everyone deserve a forever home? We are members of several web rings, so be sure to check them all out! There are many many great websites to explore in our web rings! Be sure to check out our links page, and while you are browsing the web, be sure to stop at www.stoppdd.org and make a donation! PLEASE be sure to visit www.stoppdd.org today! Together we can wipe out this terrible disease! And don't forget to stop by the Beak Apetit site, and order yours today! Despite my best efforts to get the html coding to work, the link in the above picture doesn't work, so please go to http://www.beakappetit.com and be sure to mention that were reffered by us! Thanks!